As you know Christmas is fast approaching and being a Waldorf mom, I love all natural toys. As much as I love to support the handmade crafters, financially I cannot always. So I turn to companies like Melissa & Doug. I love their wooden toys and often are getting them for Hazel. They are so creative and build the imagination and are well made. So when I heard about this opportunity, I jumped at it. Melissa & Doug are giving away a toy each day on their Facebook page. They started on Tuesday. Go over and enter to win something each day!! Now since Hazel cannot read I can tell you that Santa is bringing her Melissa & Doug's Castle Blocks. I am going to sew a back side to Hazel's zoo playmat to be a castle play mat and that will be her main present from us. Then she and Steve will have a wonderful time building and playing with her castle. She is so into princesses now. Steve still has his Lego castle from when he was young and she loves to look/play with it, but it comes apart easily. Now for the exciting part!! Melissa & Doug have offered to send me one of their Terrific Twenty Holiday Gifts for 2012 and one to one of my followers! It was hard to choose what to get and giveaway, but I have decided on the Big Rig Building Truck Wooden Play Set, because Hazel loves to play with her tools and build/fix things and I would love for her to have some wooden tools as well as something they actually work on. Right now she has plastic ones and just pretends with them. This will actually build some fine motor skills as well as her imagination. So if you have a little one or a big one who would love to play with this and live in the U.S.A. (sorry to my international followers), please enter below. We will be following my Giveaway Rules. Good luck!! We have a Melissa and Doug castle that my daughter loves! We love the slice and bake cookie set! trunki or the play kitchen! The kitchen is so fun--LOVE Melissa and Doug! Their See and Spell toy is a favorite at my house! Nico loves tools and trucks! I used to love their puzzles until my son entered his take apart puzzles, throw the pieces around and not put them back together. Instead I think the Big Rig would be great. The mailbox is so cute, because the little ones have a grandpa that is a postal carrier. I love all of their toys! I don't have a favorite! I love M&D! I like their Whittle World School Bus Set! We love the pots & pans! We are huge M&D fans! I love their puzzles, shape sorter clock and magnetic dress up sets. I love the tea set! It is so darling! I would really like Doorbell House for my daughter. My daughter would love the doorbell house. Melissa and Doug toys are awesome! So many great Melissa & Doug toys. My girls really like the dollhouses. My nieces and nephews don't have any..yet! 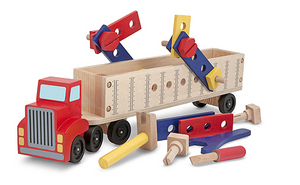 I love all of the Melissa and Doug toys but my son would especially love the big rig set. he loves trucks and he loves tools so what a great combo! My daughter would love the Big Rig Building set. She loves to build! We would love the big rig building set! I really liked the magnetic responsibility chart... at least, until the kids stole the magnets to it. I love all their play food! I like the Animal Rescue Shape-Sorting Truck Wooden Toy. We like Melissa and Doug puzzles. They have held up so well! We love the puzzles, lacing cards, and cutting food. We love the Melissa & Doug puzzles--they are awesome!! I love the Monster Puppet! All their wooden food toys. We love love love love Melissa & Doug puzzles! We love all of their chunky wooden puzzles. We've always loved our chunky wooden puzzles. I love their magnetic puzzles! I love the Rattle Rumbler Push Toy! We have always loved their wooden puzzles! I love the Doorbell House. We have lots of the food sets, like the brownies, pizza, cupcakes, etc.For the top 20, I like the doorbell house. We love their wooden blocks and tangram puzzles! So far we're huge fans of the chunky puzzles and animal magnets! I like the trunki too.